I felt the need to give back to the College that gave me so much and shaped me into the person I am today. I also wanted to become more involved in getting our fellow alumni active in the alumni community. "I would always rather be happy than dignified." I'm a partially practicing attorney, working from home for my spouse's public affairs business. I am mother to two wonderful daughters who love Grinnell almost as much as I do and I bring them back to campus every year for the Alumni Swim Meet in October. 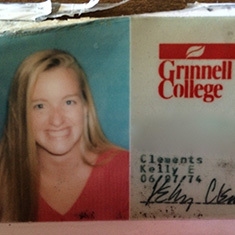 *To access Kelly's Grinnell Connect Profile, you must already be a member of the site. If you are not, register here.